Vitamin C is known for its multiple essential and supportive roles in human health. 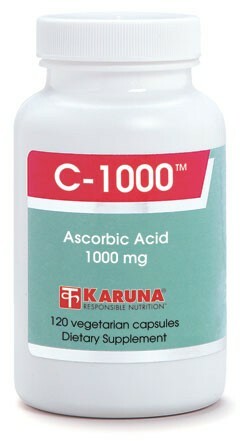 Nobel-laureate Linus Pauling famously recommended plain ascorbic acid as the most efficient form for supplementing vitamin C. Karuna's C-1000 supplies pure ascorbic acid in preservative-free vegetarian capsules for convenient use. Suggested use for adults: 1-3 capsules daily, or as directed.